SOLD Alexandre Tenor Saxophone. Made in Italy. # 18746 Good condition. New pads. Here is some info we found about Alexandre horns. 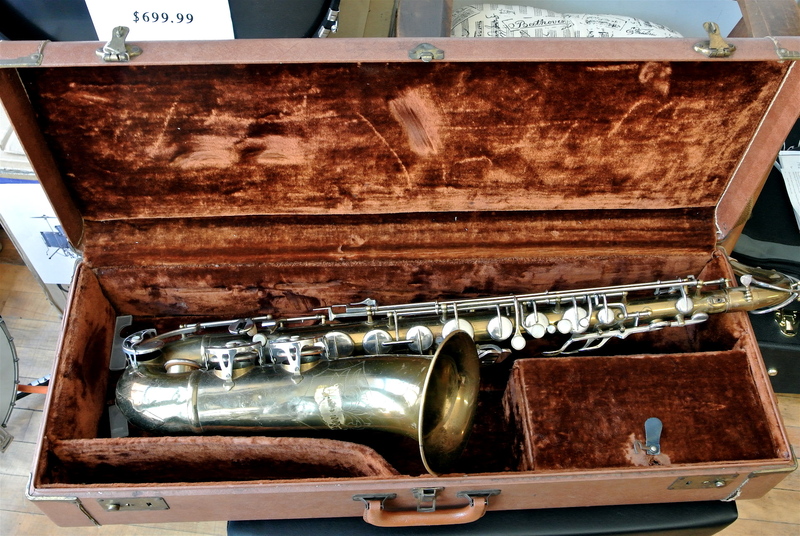 The Alexandre brand saxophones were stencil horns that were popular during the 1930's to the 1960's. What is a stencil? A "stencil" is a saxophone built by a major sax manufacturer for another company or storefront. On receipt of the saxophone, the storefront would literally take a stencil and engrave their own name or design on the horn. Usually it was the big 4 American companys that made stencils. Conn, King, Martin, and Buescher. Your sax probably was made by Grossi in Italy. They are usually the basic models built by major manufacturers, less any fancy features(multiple custom key work, gold plating, fancy engraving)with the name of the company added. I couldn't find a whole lot on Alexandre in particular except it seems that they used multiple manufacturers over the years with the main ones being Keilwerth, Grossi, Amati. Some other sites suggest that there were other manufacturers as well but don't specify. A saxophone is only as good as the metal, the action and the intonation. In the right hands any sax will play as long as it is air tight(the leather pads 100% sealing). The key heights, [higher or lower] will affect the intonation.